Do you and your students tend to do the same thing on your interactive whiteboard over and over? Us too! That’s why we were excited to talk with Rebecca Penina Simon, an interactive-whiteboard expert who’s also the director of educational technology at Solomon Schechter School of Queens. Here are some of the cool ways she’s using Teq Unlimited, a resource that combines SMART’s software with some awesome online PD and that we want to try right now. 1. Take advantage of built-in activity templates to create some seriously cool lessons. Most interactive-whiteboard software comes with activity templates that make it easier to create activities and games. But a lot of teachers don’t use them! Check them out—they’re definitely worth another look. 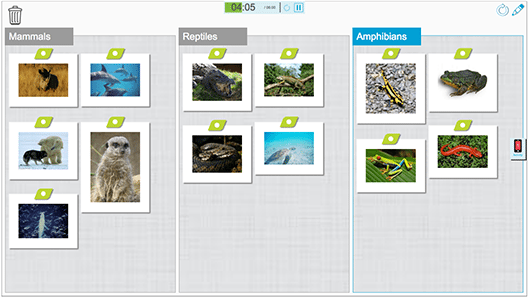 SMART’s Lesson Activity Builder (LAB), features six core activity templates that can be customized in various ways. 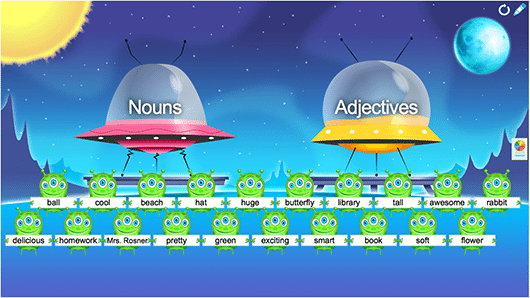 One of our favorites is Super Sort, which guides you through a series of questions to choose your theme (e.g., aliens), enter categories (e.g., nouns and adjectives), category components (e.g., beach, library, soft, green, etc.) and game components (e.g., buzzers, spinning wheel to randomly pick students, etc.). You can even import your student list, and then, voilà! You’ve got a super-fun, interactive and totally customized class activity! 2. Have students submit answers on their phones. It’s pretty much impossible to call on every student in class, but it’s still possible for all your kids to participate–even the shy ones. Use SMART Notebook’s LAB to create a Shout It Out! activity that asks kids to submit photos or text answers for each of the categories you specify (e.g., mammals, reptiles, amphibians). 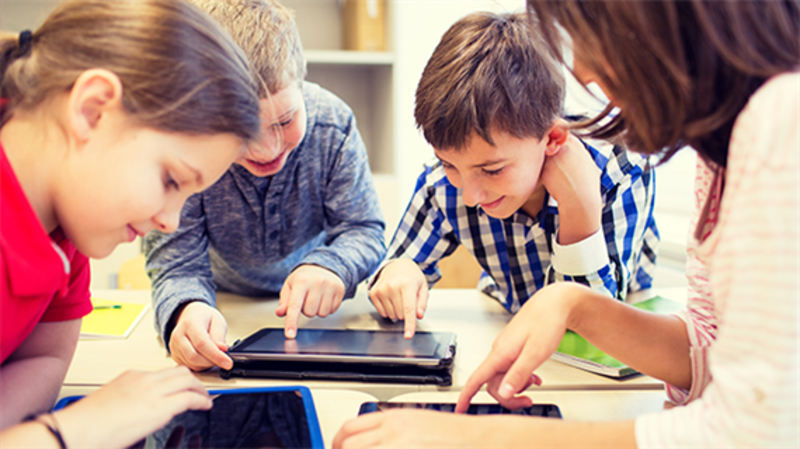 With SMART Response, your kids can use their 1:1 devices (computers, tablets or smartphones) to submit their answers. 3. Teach algebra and geometry with virtual manipulatives. If you think the only way to use an interactive whiteboard for math is to write out equations with a pen, this one is going to blow you away. You can handwrite equations or formulas, and SMART Notebook’s Math Equation Editor will turn them into typed text! As if that’s not cool enough for all you math geeks, there’s more: You can use GeoGebra to take your written or typed algebraic equations and instantly create corresponding graphs. It’s a powerful time-saver! 4. Add a smiley face to student board work. Kids love getting stickers and stamps on their worksheets, so why wouldn’t they love seeing them next to the work they do on a whiteboard? If you have SMART Ink, you can use the Stamp Pad feature to put a thumbs-up or a smiley face stamp next to a student’s correctly answered question on the board. If a student writes an incorrect answer on the board, you can stamp a sad face or an “X.” You can even add up to 20 of your own custom stamps. 5. Hand out copies without having to use the dreaded copy machine. The copy machine can be a teacher’s worst nemesis! Thankfully, if you have SMART amp, you don’t have to wait in line at the copy machine (just to have it jam!) any longer. Instead, you can digitally pass out copies of a workspace to all your students. Bonus: It saves trees too! 6. Evenly divide shapes to teach fractions. We’ve all been there. 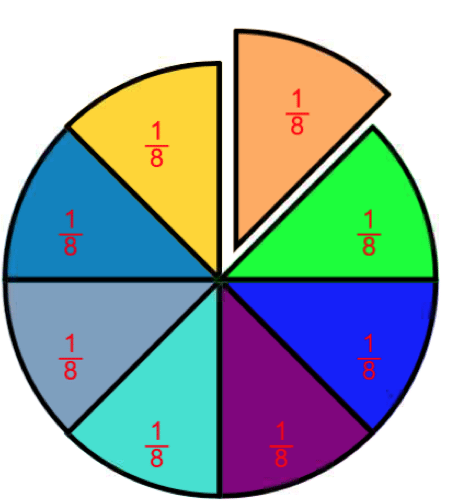 You’re trying to teach fractions by showing your class how to divide a circle into equal parts, but the sections you’ve drawn are far from equally divided (some poor kid’s going to get 1/16 of the pizza while another’s going to get 1/3!). With SMART Notebook, you can right-click on a shape, choose the number of segments and—like magic—the shape is evenly divided! If you want, you can then drag and drop individual sections anywhere on your workspace. You can even select whether or not the fraction labels (1/4, 1/8, etc.) are shown on each section. Your SMART pens aren’t just for writing on a blank canvas. With SMART Ink, you can grab a pen and write on just about anything. Use the pens to write over text in a Word document or circle pictures on a website. 8. Find out exactly who’s contributed what in group projects. When kids work offline, it can be challenging to know who really painted the diorama or worked on the poster. 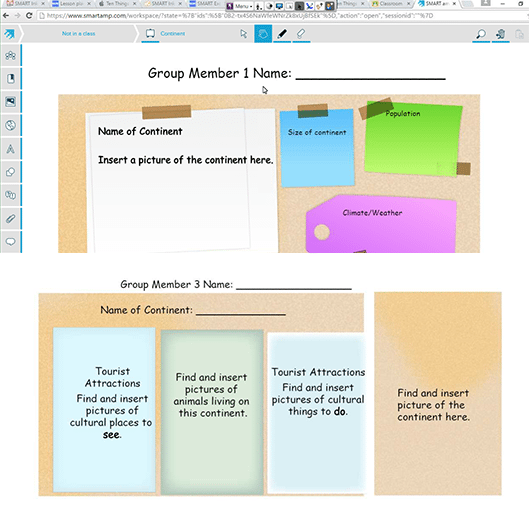 With SMART amp, you can create a digital canvas that has sections designated for each group member. It’s kind of like Google Docs—but way cooler. All group members can contribute to the same workspace at the same time, but they don’t have to be doing the same thing—one kid can do word processing while another watches a YouTube video and still another creates a timeline! The best part? Teachers can take control of the workspace to review a concept or use the “attribution” feature in real time to see exactly which students are contributing to the project. 9. Figure out which students “get” it. With SMART Response, you can choose to keep students’ answers anonymous or include their names to make it easy to keep track of which students grasped the concept. If you need to check off the Common Core box, there’s even a way to tag standards to questions and export the data to any system your school uses. Plus you can use the time you would have spent grading quizzes to plan follow-up lessons that help them practice the skills they find most challenging. 10. Knock off some PD requirements. If this list got you excited about all the cool stuff you can do with your whiteboard and left you inspired to learn more, you’re in luck. SMART offers lots of professional development options to help you keep up with all the newest features and how you can actually use them in your classroom. Teq Online PD has multiple one-hour live broadcasts each week where you have the opportunity to ask questions and chat with the instructor in real time. Or you can access more than 150 archived sessions on-demand whenever you have time. Either way, you can knock off some of your PD requirements for the year. 11. When you get stuck, connect with your own personal tech tutor. How many times have you taken a technology PD session only to forget what you learned when it came time to actually use it in your classroom? You might know you can create a graph out of an algebraic equation you wrote on the board but can’t seem to recall exactly how to access it. With the Teq PD Instructional Support Now button, you can connect with a PD specialist who’s an expert in instructional technology the moment you get stuck—or you can schedule a future time that’s convenient for you. To try out all these ideas in your classroom, check out Teq Unlimited, a software package that combines SMART’s software—Notebook, Response, Lesson Activity Builder and amp—with awesome online professional development.